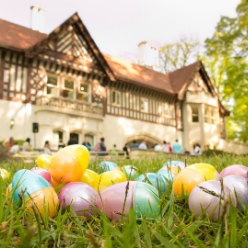 Bring your basket and your camera for a family friendly Easter egg hunt across Callanwolde's beautiful spring gardens and grounds! Eggstravaganza Easter Egg Hunt features thousands of candy-filled egg and a chance to meet the Easter Bunny. There will be a face painter, family friendly crafts provided by The Home Depot, and a kids' dance floor (beats brought to you by J&M Sound Design DJ)! An indoor bar will also be available with snacks, sodas, mimosas, coffee, and more for sale. Parking is now included in your ticket price! Egg Hunts *will* start on time. We recommend arriving early!